Generic Company Place Holder iVideo Cocktails : Watch it! Shake it! Drink it! Sometimes showing is better than simply telling, especially when it comes to the arcane arts of woodworking, cat grooming, and bartending. I’m awaiting good iPhone apps for the former two, but I can now report that iDélices’s iVideo Cocktails is the first serious video bartending app for the iPhone and iPod touch. 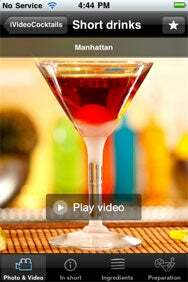 I’ll Take Manhattan: How do you make a good Manhattan? The video tutorial in iVideo Cocktails can show you how it’s done. iVideo Cocktails offers a gorgeous, user-friendly interface that lets you browse by cocktail type or by shaking your device for a random surprise. The videos are slickly produced, if a little slow to load. (Load times will be determined by the quality of your Wi-Fi or 3G connection; I found the load times to be on the long side even with a strong connection). Connoisseurs will undoubtedly quibble with some of the app’s advice—I happen to think they’re wrong about the right way to mix a proper Manhattan. But the bottom line is that novices will get a straightforward, easy-to-follow, how-to guide to make dozens of classic cocktails and a few “new classics,” too. When you’ve finished watching the video, you read details about the drinks’ ingredients and get helpful, highly specific tips and “bartender secrets” about how to mix the cocktails just so. The ingredients list also lets you modify the recipe, giving you proportions to mix for up to four people. The downside? The app is European, so all of the measurements are metric. And even though they tell you that 1 centiliter equals 0.3 ounces and 4 cl is the equivalent of 1.3 ounces, try keeping those conversions straight after you’ve had a couple of those delicious Manhattans. It would be better if users could choose their preferred units of measurement, as an app such as Skorpiotech’s Cocktails+ ( ) allows. Quite simply, if you have any doubts about how to make a drink or you just want to see how professional barmen ply their trade, iVideo Cocktails will not disappoint. The app currently sells for an introductory price of $2, instead of its normal $4 price tag. iVideo Cocktails is compatible with any iPhone or iPod Touch running the iPhone 2.x and 3.0 software updates.